Having opened in 2006, The 39 Steps is not exactly a show that screams 'review me', and yet given that it sadly closes on the 5th of September and I myself have only just seen it, I wouldn't want anyone else to miss out on seeing this hilarious show like I almost did! 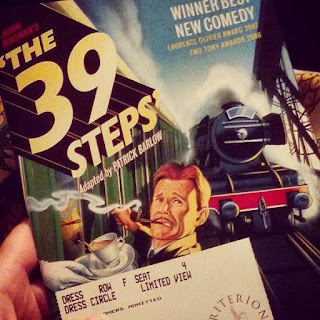 Based on Alfred Hitchcock's brilliant spy drama of the same name, The 39 Steps may connote drama and intrigue, but in this stage adaptation the story in given a comedic spin which really helps to bring the perhaps outdated elements of the plot into the 21st century. It's also given a relatively short running time of just 1 hour 45 minutes, meaning that far from dragging, or trying to translate every scene from film to stage, The 39 Steps moves along at a brisk pace, which really ramps up the excitement and urgency which the spy drama element of the plot creates. The play's hero Richard Hannay (played with gusto by the charismatic Daniel Llewelyn-Williams) is inadvertently pulled into the middle of a top secret mission, which the fate of the nation depends upon. He is joined by a whole host of characters ranging from a German secret agent to hapless Scottish Policemen. Impressively, all 150 characters within the show are played by just 4 (very versatile and energetic) cast members! As a result the audience in treated to a multitude of hilarious moments where more characters are required on stage than there are actors to fill the roles, and subsequently there are man moments where multirole-ing comes into play in the most ingenious and hilarious ways! As a comedy, there is no doubt that this Olivier Award winning play succeeds. There are moments of genuine laugh-out-loud humour, and plenty of giggles throughout the show too. It's definitely a play I'd take visiting family or friends too, as it's pretty safe and family friendly, but still features a little bit of adult humour which would no doubt go over younger children's heads. There are jokes, sight gags, some slapstick comedy and an exciting, fast paced storyline, laced with love and drama. Don't miss out! The 39 Steps closes on September 5th. If you've not seen it yet then you can book tickets here. Reviewing previews - yes or no?